Ubuntu 10.10 Maverick Meerkat or any Linux Based Operating System which uses GNOME or KDE as Desktop can enable funky 3D effects in a couple of clicks.So this post will eventually lead to the explanation of 3D effects on Ubuntu 10.10.To generate some elegant 3D effects ‘Compiz’ is used.Compiz is a compositing manager or in other words compiz enhances the overall user interaction by adding some fancy effects to your windows e.g Desktop Cube or Expo view.The other important point is that this will run with almost any hardware configuration. 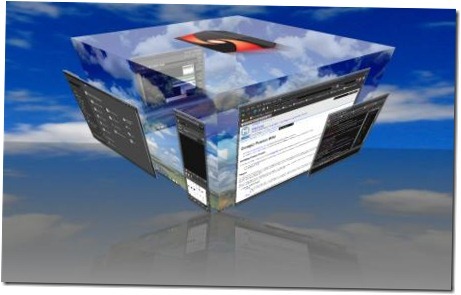 On Ubuntu 10.10,compiz is partially installed only few components needed to be installed in order to work everything properly.Compiz Configure Settings Manager(CCSM) is specifically required to configure and manage the 3d effects.You can install it either from Command Line or from Synaptic Package Manager. Open the terminal and Type the following command in the terminal followed by your ubuntu login password. That’s All ..you are done! Search for ‘ccsm’ or ‘compiz’ in the quick search bar of Synaptic Package Manager.Then Mark the packages you Required and click on ok if it asks for dependencies.Next,click on Apply button to begin the installation procedure….and wait until the installation step is finished. After installing compiz and it’s other components like setting manager you need to configure it i.e you have to select which features you want or not if yes then how…..Rest of thing is self explanatory just move to System->Preferences->CompizConfig-Setting-Manager and change the settings as you like ..in a couple of clicks.I think you are enjoying funky 3D effects …still confused ..see here 3D Effects in Ubuntu.